McDowell Bible College (MBC) is a non-profit, low tuition college and seminary serving English speaking Christian students around the world. After over two years of website, administrative and online classroom development, MBC was founded and began operating online at McDowellBibleCollege.org in Spring 2018, testing and evaluating the program through volunteer students seeking free, non-accredited religious instruction. MBC was officially formed as a non-profit, was awarded accreditation and gained state approval to operate in the Fall of 2018. MBC was opened officially for credentialed and credited instruction in January 2019. It is an institution of higher learning formed to provide a quality, inexpensive education especially needed by, but not limited to, lower to moderate income servants of God seeking service in churches or non-profit religious organizations. We exist to serve students from Christian churches who want a quality education that prepares them to serve our Lord Jesus Christ. But more importantly, we provide this service at a low cost to everyone, many times at 50% or free tuition to qualifying students through our several scholarship programs. Now anyone can afford to get the biblical, ministerial and religious service education they need without burdening themselves with governmental bureaucracy and long-term educational loan debt. It is open to any Christian who is reasonably in agreement with our Doctrinal Statement. 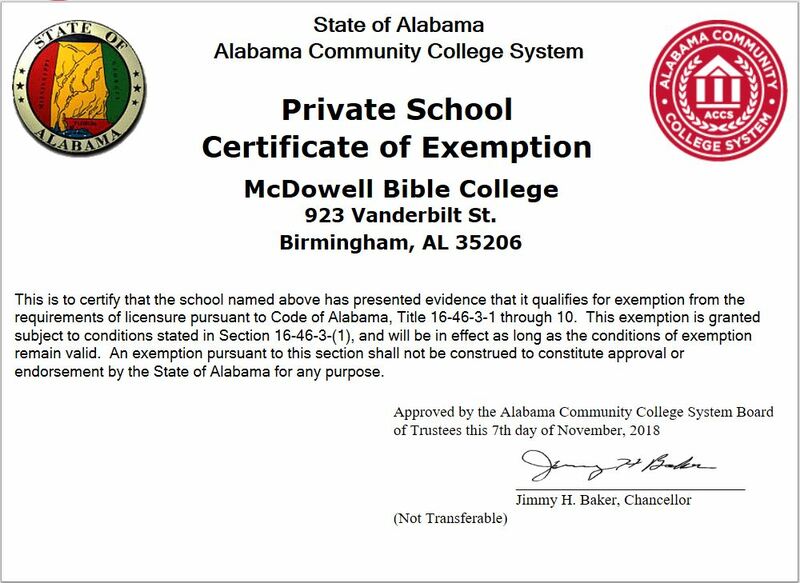 McDowell Bible College (MBC) is a private, nonprofit institution incorporated in the State of Alabama not aligned with any other institution public or private. It is recognized by the National Bible College Association as an accredited educational institution meeting their standards for certification and accreditation. MBC has received permission from the Alabama Community College System to conduct training in preparation for the ministry and service in an established church, denomination, or religion in the State of Alabama. Click on the document image links above to more accurately read the details of the state and NBCA certificates. Our academic standards are high, meeting or exceeding the level of many, if not most, older accredited college and university on-line programs. You will be proud of the certificate or diploma you get at McDowell Bible college. The school spirit for all Christian students and faculty is our knowledge that we have the assistance of the Holy Spirit as we study God's Word and prepare ourselves to better serve Him. As Christians, the interaction between students is, and should be, friendlier than you will find in a secular institution. We like to keep it that way, so as a student, remember to keep it friendly. The McDowell Bible College logo is the McDowell coat of arms with the words "Bible College", our school motto, the cross and a bible added. The school motto is the latin phrase sed Deus illuminat which means "God enlightens". The symbolic mascot of MBC is the Saints. Being mostly an on-line college, we do not have any athletic or scholastic teams at this time. However, as Paul wrote to the early churches calling those members 'Saints', we likewise strive to be like those spoke of, studying His Word so that we might serve Him better as the McDowell Bible College Saints. The school colors are Blue, White and Gold. Blue signifies truth and faith. White reminds us to be pure in our thoughts and actions. Gold signifies the Glory of our Lord Jesus Christ who we lift up in all that we do. We encourage wearing the school logo and colors proudly, so we occasionally offer reasonably priced student apparel and other items with the logo for sale to our students. The proceeds from those sales are used to help keep costs down for students and allows us to offer scholarships to more. Interactive Online Global Classroom - We envision a diverse international faculty and student body from around the world in scope, therefore our students can form relationships in their classes with Christians worldwide. They then have a global identity through McDowell Bible College that is Acts 1:8 in scope. This comes from interaction between students and between students and faculty, as we encourage our instructors to add discussion forums as part of the class requirement. These bonds will be carried throughout their life and the perspective of global Christianity is one that adds significantly to their educational experience. MBC is founded by Pastor Larry Joe McDowell who has served the Lord off and on as musician, choir director, worship leader, Gideon speaker and pastor over many decades. He began at the age of 15 as church organist. Larry played piano and organ, led choirs and taught Sunday School in military chapels around the world during his 20 years of military service. While in the military, he received his first master’s degree in Computer Resources Management and became a professional programmer analyst, carrying that work on for many years after retiring from the Army. Upon receiving the call to pastoral ministry, he attended seminary to obtain two additional graduate degrees in ministry and divinity and is a doctoral candidate in ministry. He now serves as a senior pastor of a church in addition to his duties as Dean of McDowell Bible College. In and out of the military, he is well traveled, having lived in many countries in North America, Latin America, Asia and Europe. While traveling, he was an adjunct lecturer in five colleges and universities from Japan to Germany to the U.S. In his travels Pastor Larry has met Christians, pastors, chaplains and missionaries from around the world. It was his global experience, college teaching experience, online seminary experience and programming skills that combined to inspire him to spend years building the international online college and seminary now known as McDowell Bible College. The naming of the institution was not a matter of ego, but by putting his name on the institution, he wanted to show that he was fully vested in its success. Pastor Larry now serves as the Dean of the College and a director and President of MBC non-profit corporation. He also does some lecturing in our courses and manages our IT department, on-line software and computer resources. Dean McDowell also holds a lifetime teaching credential from the California Community Colleges system to teach "English, Writing, Technical Writing, Business Writing, Journalism, English as a Second Language, History, Geography and Social Studies" at the community college level. The three graduate degrees and California credentials allow him to teach and manage the courses for a wide array of subjects that the school offers. Dean McDowell is married to Qunhong Tan who is a chemical engineer with over ten years of experience. She teaches our religious focused math and science survey courses. She is also a director of the college non-profit corporation and Director of Admissions and Registration. "Hong" comes from Jiangmen, China where Dean McDowell married her and lived for a year teaching English in private and public schools in the area. They now live in Birmingham, Alabama where they work hard for the college and minister at their church. As with any institution of higher learning, in order to keep tuition low and to support as many students who want a Christian education as possible, we depend on donations to our institution from many Christians around the world. We ask that you help us to keep this dream a reality. We hope you will take the time to donate and help us meet this mission of training more church ministers, leaders, administrators, teachers and workers from around the world as they prepare to teach the Gospel of Jesus Christ locally and to the "ends of the earth". Please donate through our safe and secure non-profit PayPal account which is linked labeled 'Donate' below.